Vinyl and Tile Floors: Mopping is recommended instead of scrubbing on your knees. Mop small segments in front of you, pushing forward and then backward without leaning forward. Then step to the next section of floor without rotating or bending your spine. The key is to keep the mop in front of you while standing with your back straight. Windows: Stretching upward to wash windows is inviting trouble, so be sure you are level with the area you are cleaning. Keep your feet on the ground (or ladder/step stool) and you’re back straight. Your head should be in a straightforward position, not tilted back or upward for a long period of time. To reduce your chances of falling, never climb on furniture or windowsills to clean windows. If you use a stool or ladder, it should be level, sturdy and free of cleaning materials that can spill or trip you. Bathtub: Kneeling outside the tub and then bending and stretching forward is not recommended. Instead, stand outside the tub with your spine in a straight position and use a mop to clean tile walls and the tub. If you need to really scrub, climb in the tub and bend at the knees, never at the waist. Work in short spurts and take frequent breaks to avoid strain of scrubbing for long periods of time. Painting: More force than you would expect is placed on the spine and neck when pushing a paintbrush or roller. The easiest way to paint is with a sprayer. But if you must use a brush or roller, keep it in front of you and waist-high so that your spine is straight. Looking up at high walls or ceilings for extended periods of time can put extra pressure on nerves and cause pinching and numbness. Painting in short intervals and taking frequent breaks are recommended for any type of house painting. 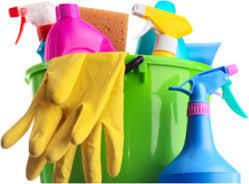 You’ll never avoid a few achy muscles from time-to-time after you clean or spruce up your house, but following these simple tips can help make spring cleaning safe and void of mishaps.